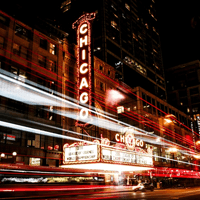 Hopping on board one of the following chicago party bus options is sure to be an immersive party experience that you'll remember for years to come. Our vehicles are especially popular with events such as a night out on the town. We'll be happy to take you to spots like Delilah's, Three Dots and a Dash, the Violet Hour, the Whistler, or any destinations you might have in mind for the festivities. The various different amenities that can be found inside of our buses make for the perfect transportation experience regardless of the event, so you can put your trust into us for even the most important events like a wedding at Loft on Lake or Carnivale. 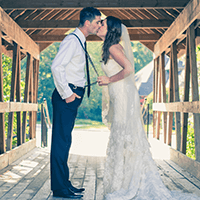 We've provided service to weddings at nearly every venue that you can think of in the area, and that's only one of the perks of choosing our transportation. When you are planning an exciting evening on the town in Chicago and the surrounding areas, you've got to choose the most thrilling form of group transportation available! A party bus! 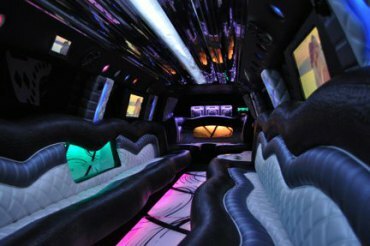 Chicago Limo Bus has a large selection of incredible party buses for you to choose from, all with the exciting perks that you expect from comfort features to entertainment features! Plus we put our customer's safety and protection first, so all you've got to concern yourself with is having a great time on the road! No other company in the area has put so much time and effort into building a fleet of mind-blowing buses as we have, and it shows when you view our fleet of impressive buses. Our team has put hour after hour into the business to make it what it is today, and our customers are the ones who enjoy all the benefits of that! Not only are we able to offer you a superior service, but we can do it at a price that makes sense for all budget points. You aren't going to have to break the bank in order to enjoy a fun night out with your friends, especially when we're the transportation company that you decide to call. 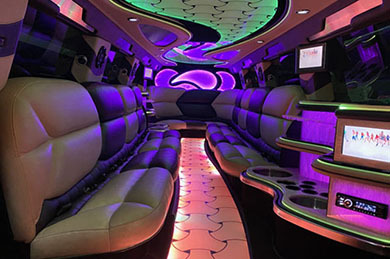 When we mention luxury, we're talking about premium leather seating, stripper poles, HDTVs, DVD players, HD antennas, built-in bars with coolers, LED and fiber optic lighting, and more. It's true when our customers say that riding in one of our buses is like having your own private VIP suite on the road. If you haven't experienced that for yourself, then it's about time that you do! Browse the site and give us a call! 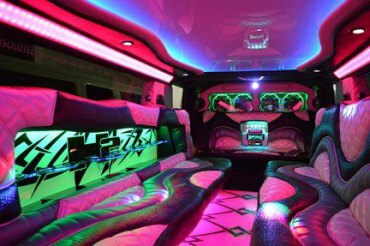 We promise that we can provide the best possible party bus service that you can possibly get in the Chicagoland area. We go the extra mile where other companies don't. 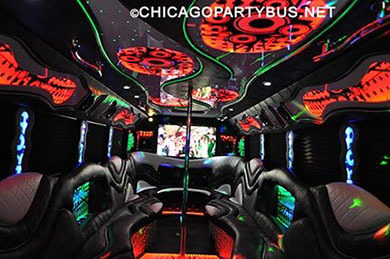 See why we are the #1 choice for party buses for Chicago residents. We have some more suggestions for likeminded companies! If you're heading out on the town to go bar hopping visit our friends at chicagoloopbars.com. If you want to check out a cubs game the best source for tickets is Wrigley Rooftop Tickets. These companies offer the same attention to detail that we do, and that's why we feel comfortable referring them to you! If you're looking to hit the town for a night in a party bus but aren't in the area we can recommend Metro Detroit Party Bus, Denver Limo Bus, or daytonabeachpartybus.com. The benefits that come with renting luxury transportation are plentiful, especially when you consider you will be together with friends along for the ride in your late model limo rental. There is no better way to transport a large group of passengers to and from your drop off in complete style and courteous comfort. It's just as easy to use a bus for a Bears game as it is to check out Lollapalooza, Pitchfork Music Festival, Taste of Chicago, Pride Parade, Gold Coast Art Fair or just a night on the town, we are available for all occasions and each and every outing. It can be such a pain to try and navigate yourself through the city and surrounding areas, especially if there happens to be a large event going on. This is why so many locals and tourists decide to go our route for their transportation service needs! We feature gorgeous flat screen tvs for your premier blast in your ride with a CD/DVD player and sound system. When your special limo buses are parked in style you'll enjoy our HD antenna for live broadcasts, and when you're on the road you'll enjoy our DVD player to watch your favorite flicks! And for corporate transportation, take advantage of our luxurious HDTVs and audio systems for all your business needs too, including meetings on the road and presentations! Unforgettable wrap around seating, dance floor & dance poles. The LED and fiber optic lighting that we feature in our buses really sets the mood and relaxes you. Our buses can accommodate smaller groups and larger groups with equal eases! Our high quality 1400 watt sound systems will surpass your needs when it comes to music and audio entertainment. Built-in bars so you can enjoy ice cold drinks while cruising. Dark tinted windows for total privacy on the road. Think about it, you're never going to have to hurriedly find directions or calibrate your GPS when you have a professional chauffeur in charge of your ride, and you definitely wont have to worry about the quest of finding a designated driver at the end of the nights festivities with you call us today to discuss booking your next special occasion with us. You're left with a safe way to travel through town that goes above and beyond any ride share service that you might think about using, we offer a chauffeur service as the driver which will exceed your high expectation. Our ability to pass down our savings to you is only one of the reasons why you'll never find a higher quality service to rent from, and our concerned customer service is another reason. There is never a period of time where you will be unable to reach us, and that is because we think it's important that each of your questions is answered as soon as it arises. A magical, love filled day that changes your life for the better after you say "I do". 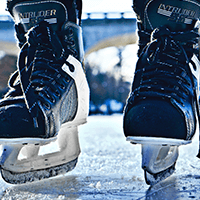 Blackhawks, Bulls, Bears, Cubs, and the White Sox are all great teams to watch. Unlimited possibilities of attractions, events and things to see and experience. 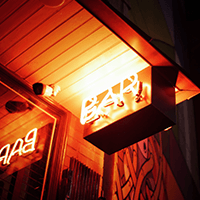 With a non-stop city, you can expect some great bars to serve some great brew. Are you a tourist checking out Chicago? Our party bus rental service is perfect for you and your friends to visit all the sights safely. No matter if it is your first time or twentieth time visiting the Windy City, there are always new and exciting places to head toward with Chicago Party Bus. Sightseeing tours are one of our many specialties, as we've come to know all of the streets of Chicago and exactly how to get to all of the most popular places for your pleasure. We'll be happy to take you to places like Navy Pier, Millennium Park, Shedd Aquarium, the Field Museum, and around the Magnificent Mile in a luxury limousine for memorable trips. If you have a specific itinerary you'd like us to follow or you need some suggestions, we specialize knowing the areas we travel in! Our customer service representatives will help you plan a well rounded trip, so give us a call when you're ready to get your questions answered. Have questions? Ready to get your free quote? © 2019 Chicago Party Bus. All rights reserved.